There’s a reason why saffron is the most expensive spice in the world, retailing at an average of just over $2000 per kg (mind you, there’s ALOT of saffron in a kilogram – somewhere between 155,000 – 440,000 hand-collected threads, to be semi-precise). It gives a wonderfully sweet, kind of earthy, almost honey-y taste to food, and imparts a gorgeous yellowy-orange colour that makes anything look prettier. It’s typically sold in 0.1-0.5 g portions, and while it may seem a bit of an extravagant purchase, it’s truly worth it – the saffron absolutely makes this dish, and I wouldn’t even attempt to cook this recipe without saffron. You can, of course, but I doubt you’d be as impressed as if you’d used it. Anyway, on to the recipe! Preheat the oven to 190c. Place the pumpkin, onion, carrots, and zucchini in a large mixing bowl, add the olive oil, 1 tsp salt, 1 tsp pepper, and toss to coat. Spread out the vegetables onto a baking tray, and roast for 25-30 min, turning once with a spatula about midway through. While the vegetables roast, bring the vegetable broth to a boil in a saucepan. Remove the pan from the heat, and stir in the margarine, remaining 0.5 tsp pepper, cumin, saffron, and salt to taste. Cover the pan and steep for 15 min (I let it steep until the vegies were roasted). Scrape the roasted vegetables and their juices into a large saucepan, and add the cous cous. Bring the vegetable broth back to a boil, and pour over the cous cous mixture all at once. Cover the saucepan with a lid and allow to stand for 15 min. 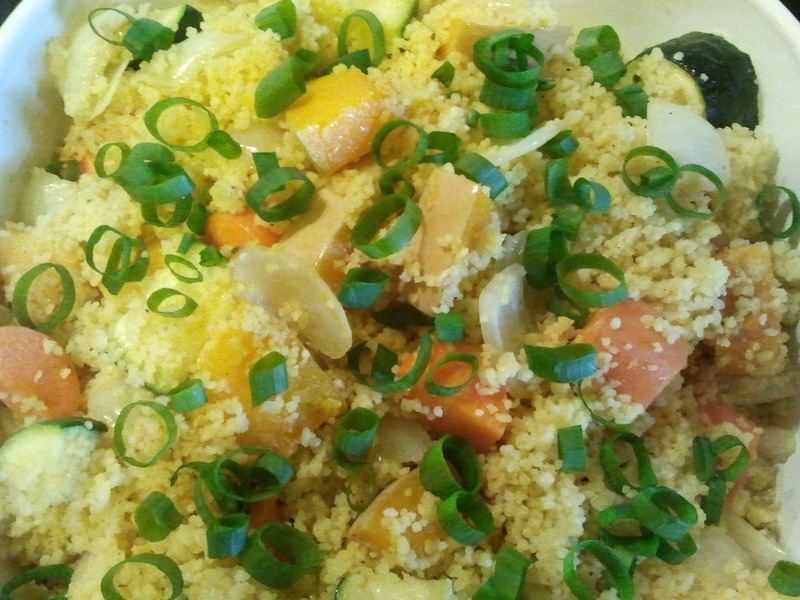 Add the spring onion, toss the cous cous and vegetables with a fork, and serve.